Includes electrodes, lead wires, battery, instruction manual, hard case. Adjustable, 1~8 seconds, 1 Sec./ step, The ?n?time will increase and decrease in the setting value. Modulation mode is a combination of pulse rate and pulse width modulation. The pulse rate and width are automatically varied in a cycle pattern. The pulse width is decreased by 50% from its original setting in 0.5 second, then the pulse rate is decreased by 50% from its original setting in 0.5 second. Total cycle time is 1 second. In this mode, pulse rate(2-150Hz) and pulse width(50-300μs) are fully adjustable. What is an EMS Muscle Stimulator Unit and How Does It Work? Electrical Muscle Stimulation is an internationally accepted and proven way of treating muscular injuries. It works by sending electronic pulses to the muscle needing treatment; this causes the muscle to exercise passively. It is a product derived from the square waveform, originally invented by John Faraday in 1831. Through the square wave pattern it is able to work directly on muscle motor neurons. This is being widely used in hospitals and sports clinics for the treatment of muscular injuries and for the re-education of paralyzed muscles, to prevent atrophy in affected muscles and improving muscle tone and blood circulation. How does Muscular Stimulator work? The EMS units send comfortable impulses through the skin that stimulate the nerves in the treatment area. Because the stimulation of nerves and muscles may be accomplished by electrical pulses this modality can help prevent disuse atrophy. Accordingly, incapacitated patients can receive therapeutic treatment to create involuntary muscle contractions thereby improving andmaintaining muscle tone without actual physical activity. The EMS Muscle Stimulator is an easy to use system. A marvel of miniaturized electronics the lightweight power unit transmits electrical pulses through the skin surface and stimulates motor units (nerve and muscles). The electrical impulses are "ramped" so that they closely emulate natural muscle contractions. EMS is helpful in conditions where the reduction of physiological range of motion is due to or the result of fractures with consequent immobilization, operative intervention, or arthroscopy, in shoulders, knees, and backs. EMS units are used to treat a number of medical conditions that require muscle stimulation. The most common are: long-term disuse after fracture or prolonged bed rest, progressive strengthening for join and muscle injury, immoblized limbs, atrophy prevention , stress incontinence, muscle weakness, improving muscle tone, after weight loss or childbirth, muscle spasticity following a stroke. Most common uses: Prevent or retard disuse atrophy, strengthening programs, reeducate muscles, postop orthopedic surgery, joint replacement, gait training, shoulder subluxation and reduction of muscle spasms. Electrotherapy can help relieve and manage chronic pain. This kind of pain is usually the result of an accident or other injury, perhaps to the lower back or a joint in the hand or knee. If it lasts long enough, the pain itself becomes a disease. The most common forms of chronic pain are back pain and arthritis. Chronic pain is often treated with over-the-counter painkillers and prescription drugs. These drugs may have unwanted side effects and can be very expensive. 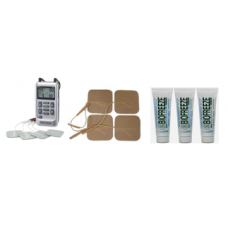 LGMedSupply has an excellent selection of Muscle Stimulators and TENS/EMS Combo Units. These are our top selling units. One is digital meaning you push buttons to make your adjustments on the screen, one is analog meaning you turn the dial to make your adjustments, change programs and settings, and also you see our DUAL COMBINATION Unit which is both a TENS and EMS in ONE! All units come complete and new with hard carrying case, 9 Volt battery, 45 inch lead wires, and 4 electrodes which last 20-30 times. Electrical Muscle Stimulation, also known as EMS, is a very popular way to shake the muscles and prevent muscle atrophy. Some patients need it desperately, that’s why a lot of doctors use it on a regular basis. EMS is good when the patient has been suffering from strong injuries and is put to bed for a long time. Muscle atrophy can be a consequence of this, so electrical muscle stimulation is the only way for these people to get their muscles strong again. The electrical impulses are a strong stimulation for the muscles, and they really suffice in making the body feel in good shape again. The low voltage is usually done on smaller, involuntary muscle groups, which cannot be stimulated in other ways. The low voltage also stimulates the brain, which starts sending impulses through the involuntary muscles, thus stimulating them as well. You may as well buy the device from an online store, or any kind of specialty store, and you can find for the meager price of twenty bucks, batteries and electrodes included. Many people find their final relief when using the EMS device. It is so practical and easy to use. There are few things easier to comprehend. You can find cheap battery-loaded devices, as well as electronic plug-in stimulators, both for no big costs. The best thing about these devices is that you can also use them to lose weight and give tone to your muscles. You can make your muscles stronger and fitter. This kind ofstimulation is considered a safe way to keep a good form.